ସଂସ୍କୃତରେ ଅଶୋକର ଅର୍ଥ ହେଉଛି : "ଯନ୍ତ୍ରଣା ହୀନତା" । ଖୀ. ପୂ. ୨୬୦ରେ ଅଶୋକ କଳିଙ୍ଗ (ବର୍ତ୍ତମାନ ଓଡ଼ିଶା) ଆକ୍ରମଣ କରିଥିଲେ ।  ସେ କଳିଙ୍ଗକୁ ପରାସ୍ତ କରି ନିୟନ୍ତ୍ରଣରେ ରଖିଥିଲେ, ଯାହା ତାଙ୍କର ପୂର୍ବପୁରୁଷ କରିପାରିନଥିଲେ। । "ଅଶୋକଙ୍କ ପ୍ରତିଫଳନରେ କଳିଙ୍ଗ ଯୁଦ୍ଧର,ଫଳାଫଳ୧୦୦,୦୦୦ ମୃତ ଏବଂ୧୫୦,୦୦୦ଆହତ, ଯୁଦ୍ଧ ଶେଷରେ ପ୍ରାୟତଃ ୨୦୦,୦୦୦ ମୃତ୍ୟୁବରଣ କରିଥିଲେ"।। ଅଶୋକ ଖ୍ରୀ. ପୂ. ୨୬୩ରେ ବୌଦ୍ଧ ଧର୍ମକୁ ପରିବର୍ତ୍ତିତ ହେଲେ।। ଅଶୋକ ବୌଦ୍ଧଧର୍ମର ପୃଷ୍ଠପୋଷକତା କରିଥିଲେ ଓ ଭାରତ ବାହାରେ ବୌଦ୍ଧ ଧର୍ମକୁ ପହଞ୍ଚାଇବାରେ ବିଶେଷ ଭୂମିକା ବହନ କରିଥିଲେ"
A ପ୍ରାୟ 1910 painting by Abanindranath Tagore (1871–1951) depicting Ashoka's queen standing in front of the railings of the Buddhist monument at Sanchi (Raisen district, Madhya Pradesh). 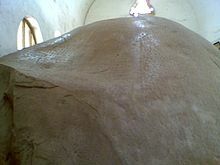 Ashoka's Major Rock Edict at Junagadh contains inscriptions by Ashoka (fourteen of the Edicts of Ashoka), Rudradamanna I and Skandagupta. 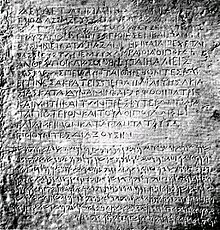 Bilingual inscription (in Greek and Aramaic) by King Ashoka, discovered at Kandahar (National Museum of Afghanistan). ↑ ୫.୦ ୫.୧ Jerry Bentley, Old World Encounters: Cross-Cultural Contacts and Exchanges in Pre-Modern Times (New York: Oxford University Press, 1993), 44. ↑ Smith, Vincent A. (1901). 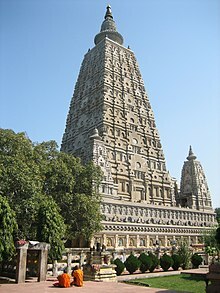 Asoka - the Buddhist Emperor of India . Rulers of India series. Oxford at the Clarendon Press. p. 130. ↑ Kamath, Prabhakar. "How Ashoka the Great Gave Brahmins A Song With Which They Conquered India". 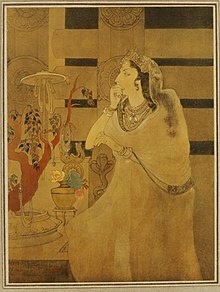 Nirmukta. 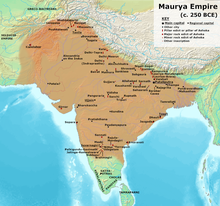 ↑ "Ashoka - Ancient History Encyclopedia". Ancient.eu. Retrieved 2015-08-08. ↑ Goonatilake, Hema (30 May 2010). "Edwin Arnold and the Sri Lanka connection". The Sunday Times. Asoka ବାବଦରେ ୧୯୧୧ ଏନ୍ସାଇକ୍ଲୋପିଡ଼ିଆ ବ୍ରିଟାନିକାର ଗୋଟିଏଲେଖା ଉଇକିସ୍ରୋତରେ ରହିଛି .